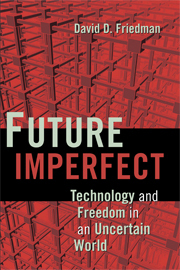 Future Imperfect author David Friedman recently spoke at the Cato Institute in DC. Slate’s William Saletan attended, and he seemed to have enjoyed himself. Anyone who’s watched Friedman lecture will see how entertaining and engaging he can be. Check back soon — I’ll post the audio from Cato once they’ve compiled it. I just got back from a talk by David Friedman at the Cato Institute. Fascinating guy, thinks a mile a minute. He must have spat out 100 provocative ideas in his half an hour or so. I can draw you a mental picture of him pretty quickly: bubbly, balding, not much over five feet tall, wears a backpack over his tweed jacket (did I mention the “recreational medievalism“?) . . . In short, the book covers nearly everything Human Nature covers but with a libertarian bent. Which is sort of my bent, too, except that I’m less theoretically confident than Friedman is–or, to put it the other way, I’m more daunted by practical developments. Three years ago, for example, I wrote a series based on the idea that scientists would try to grow embryos beyond the conventional two-week limit, raising icky possibilities. The scenario made sense to me at the time, but in the three years since, it hasn’t happened. A theorist would say, well, it’ll happen eventually. I’m not so sure. My reaction is: Maybe I was just wrong. So this is what I asked Friedman: Is there a contradiction between his technological optimism and his premise of radical uncertainty? When I say optimism, I don’t mean a belief that technology will be good; I mean a belief that it will work. His talk was full of bold scenarios: conquering aging, developing artificial intelligence 100 times smarter than us in the next 30 years, and administering mind-control drugs that induce credulity. I agree that these scenarios are fascinating, and when I first came into this field, I took them very seriously. But everywhere I look, the news is telling me another story. The story is that in many fields, and in biology in particular, causality is turning out to be way more complex than we anticipated. The immediate manifestation of that complexity is that even our most conventional attempts to manipulate biology are producing unexpected and often decisive ill side effects. Take the most obvious case: drugs. Friedman talked about three classes of mind drugs: those for pleasure, those for performance, and those for controlling other people. I’ve been to visionary or bioethics conferences where theorists have talked up these drugs and how cool or scary they’ll become in the near future. But look at the news: Drugs are being restricted or pulled off the market because they’re inducing ugly side effects. Not just drugs for the body, like Vioxx, but drugs for the mind, like Chantix. Steroids are boosting athletic performance but causing violence and circulatory trouble. Marijuana is being linked to heart attacks, brain shrinkage, and psychosis. I had high hopes for Bremelanotide, a new sexual-dysfunction drug, aka aphrodisiac. But last year its developer, Palatin Technologies, had to abandon that project due to “blood pressure increases” in some study participants. The company now touts the drug for “organ protection.” It’s turning out to be very hard to tinker with one function of the mind or body without affecting others. Friedman’s reply to all this was that we do better off “on net” by encouraging biotechnology than by limiting it, and that proposals to restrict it should be subject to the same skepticism that we might apply to the technology itself. That makes sense to me. Still, it’s just a political answer. It doesn’t address the underlying question of how soon–or even whether–biotechnology will achieve its promises. I agree with Friedman that the future is radically uncertain. Too uncertain, in fact, to count on its arrival in the form that he envisions–or I do–anytime soon.